An unexpected promotion to junior executive appears to be just the ticket. But with her new responsibilities comes an entirely alien world of corporate intrigue and scheming executives—most notably dashing newcomer Milo Beeber. However, opportunities abound for a girl with a killer instinct ... until she unexpectedly finds the man of her dreams not in Beeber, but in Detective Bill Malloy. Unfortunately, he's intent on solving the mystery of the recent deaths at the company. A murderous fable of modern success and love, Miss Nobody is a darkly comic look at one woman's rise up the corporate ladder and the delightful – but complicated – romance that ensues. 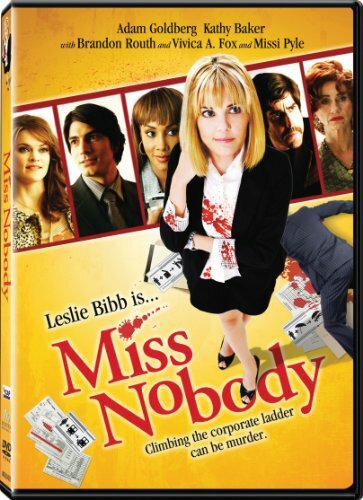 LOS ANGELES — Sept. 1, 2011 — For Immediate Release — Nine to five will get you 20 to life ... so a young woman learns in the romantic comedy Miss Nobody , available on DVD Sept. 27 from Inception Media Group. Unlucky in love, living at home with her eccentric mom (Kathy Baker, Cold Mountain, Cider House Rules, CBS' Picket Fences) and stuck in a dead-end secretarial job, Sarah Jane McKinney (Leslie Bibb, the upcoming Zookeeper, ABC's new fall series Good Christian Belles, Iron Man 1 & 2, Talladega Nights) longs for more out of life. An unexpected promotion to junior executive appears to be just the ticket. But with her new responsibilities comes an entirely alien world of corporate intrigue and scheming executives—most notably dashing newcomer Milo Beeber (Brandon Routh, Scott Pilgrim vs. the World, NBC's Chuck, Superman Returns). However, opportunities abound for a girl with a killer instinct ... until she unexpectedly finds the man of her dreams not in Beeber, but in Detective Bill Malloy (Adam Goldberg, Déjà Vu, A Beautiful Mind, Saving Private Ryan). Unfortunately, he's intent on solving the mystery of the recent deaths at the company. Also starring Vivica A. Fox (Batman and Robin, Kill Bill, Vol. 1, Independence Day), Missi Pyle (Charlie and the Chocolate Factory, Along Came Polly, Galaxy Quest) and Barry Bostwick (Rocky Horror Picture Show, ABC's Spin City). Miss Nobody is presented in widescreen with an aspect ratio of 2.35:1 and 5.1 digital audio.